A French giltwood carved barometer from the 19th century, with eagle and laurel wreath motifs. Born in France during the 19th century, this barometer features an oval carved frame topped with an exquisite crest, adorned with a majestic eagle resting on a sphere and surrounded by a laurel wreath. A delicate garland leads our eye to the oval frame, accented with petite beads on the outer molding and rais-de-cœur on the inside. The faded barometer face showcases two hands, one of which presents a whimsical twirling shape on its extremity. The barometer finds its conclusion in the carving of the lower section, featuring foliage and pinecone motifs. With its elegant lines and golden hue with red undertone, this French 19th century barometer will enliven any wall beautifully. 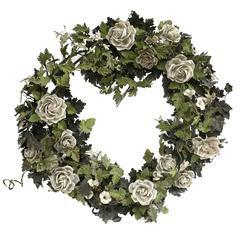 Painted tole wreath with handcrafted Roses. Perfect for hanging or as a centerpiece. Beautiful antique statement barometer from France. Made of gilt bronze. circa 1870. Measures: 36 inches height x 17inches wide x 6 inches deep.